Risk and return assumptions are a key input to strategic asset allocation models, but these assumptions are often static or at least very slow-moving over time, leaving investors with unchecked downside risk at times. It may be prudent to maintain a stable overall strategic allocation but incorporate more dynamism within the predefined equity allocation as a way to adapt to changes in risk regimes. This approach potentially reduces long-term risk without changing an allocation’s return profile, improving compounding benefits and, in turn, encouraging more disciplined savings behavior. Variable beta strategies attempt to do just that. 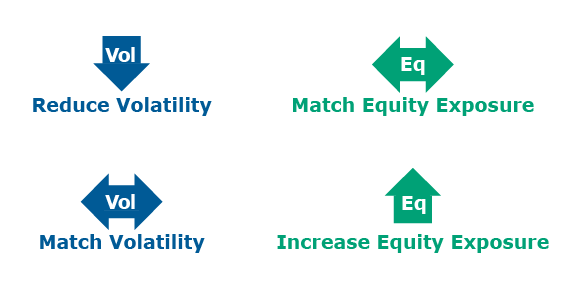 These types of strategies are designed to adapt automatically to equity risk regimes in order to protect on the downside and participate in the upside. This strategy can be incorporated into an asset allocation in two different ways. An investor can reduce the total volatility of a portfolio while maintaining the same equity exposure. Or an investor can maintain the volatility of the portfolio while increasing equity exposure and improving return potential. We illustrate the benefits of adding a variable beta strategy to an asset allocation model by demonstrating its efficacy in a target date strategy. Target date strategies are a popular choice in defined contribution plans, but they are also limited by their constant risk premia assumptions. These static assumptions often ignore the substantial drawdowns that can arise from the equity allocation, which reduce compounding benefits and exacerbate poor timing decisions by plan participants. Both have negative long-term return consequences on wealth accumulation. Our analysis uses the Morningstar Lifetime Allocation Moderate Index as a “Base Case,” a robust benchmark for target date strategies. We create two alternative target date glide path models by substituting some of the equity index portion of the allocation with a hypothetical variable beta strategy. In the first case, we create the Reduce Volatility model. Here, we substitute 1/3 of the equity portion with a hypothetical variable beta strategy. Our goal in this model is to reduce portfolio volatility while matching the total equity exposure of the Base Case. The impact on volatility is illustrated in Figure 1. It shows a reduction in volatility throughout the glide path while maintaining the same overall equity exposure. 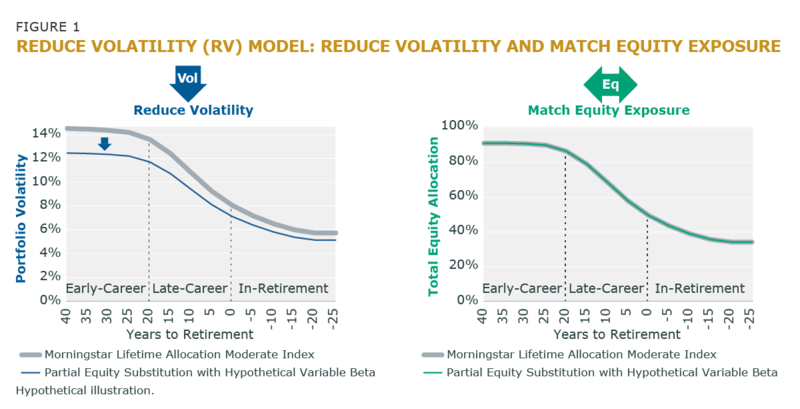 Variable beta strategies can adapt to equity market risk regimes within existing allocation approaches. By using variable beta strategies, investors can make their strategic asset allocation models more dynamic without changing their long-term risk and return assumptions. Overall portfolio efficiency improvements are possible because these strategies attempt to mitigate equity market drawdowns while participating in the market’s upside. In turn, participants in target date strategies benefit from the potential of improved compounding effects and volatility reduction that encourages more disciplined savings behavior. The information expressed herein is subject to change based on market and other conditions. The views presented are for general informational purposes only and are not intended as investment advice, as an offer or solicitation of an offer to sell or buy, or as an endorsement, recommendation, or sponsorship of any company, security, advisory service, or fund nor do they purport to address the financial objectives or specific investment needs of any individual reader, investor, or organization. This information should not be used as the sole basis for investment decisions. All content is presented by the date(s) indicated only, and may be superseded by subsequent market events or other reasons. Past performance is no guarantee of future results. Investing involves risk, including possible loss of principal and fluctuation of value. The hypothetical illustrations presented are not real and have many inherent limitations. They do not reflect the results or risks associated with actual trading or the actual performance of any portfolio, and have been prepared with the benefit of hindsight. Therefore, there is no guarantee that an actual portfolio would have achieved the results shown. In fact, there will be differences between hypothetical and actual results. No investor should assume that future performance will be profitable, or equal to the results shown. In no circumstances should the hypothetical results be regarded as a representation, warranty, or prediction that investors will achieve or are likely to achieve the results displayed or that investors will be able to avoid losses. The hypothetical results do not reflect the deduction of advisory fees and other expenses, which will materially lower results over time.